Join SFA Gardens for its annual Little Princess Tea Party at 10 a.m. and 1 p.m. on March 30. 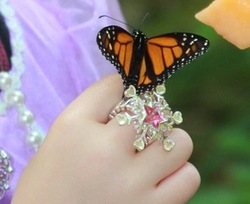 Attendees will meet butterflies, build a fairy garden and learn about "The Brave Heart of a Princess" during the event. NACOGDOCHES, Texas - SFA Gardens will host its annual Little Princess Tea Party at 10 a.m. and 1 p.m. Saturday, March 30, in the Ruby M. Mize Azalea Garden on the campus of Stephen F. Austin State University. Make plans to join charming butterfly fairies for a delightful party with treats, fairy gardens, magic and merriment among the enchanting pines and azaleas. "The Little Princess Tea Party has become a popular tradition at SFA Gardens," said Elyce Rodewald, SFA Gardens education coordinator. "This event provides an opportunity for children to experience the outdoors in a unique way and spend quality time with family members. It definitely encourages creativity and imagination, and I think the adults have as much fun as the children." Princesses are encouraged to wear their favorite princess or fairy apparel and enjoy a magical day in the garden. This event is recommended for princesses ages 3 to 10 who are accompanied by an adult. Tickets cost $35 per person and can be reserved online at sfagardens.sfasu.edu. Seating is limited. For more information, contact SFA Gardens at (936) 468-1832 or sfagardens@sfasu.edu.